Since childhood I have loved the Chronicles of Narnia, whether it was reading the books or watching the BBC late 1980s adaptations so I was delighted to be in the audience for the opening night of Hallam ’89 Theatre Club’s production to discover how they bring the classic C S Lewis tale alive on stage. Adapted for the stage by Glyn Robbins, the production introduces the audience to Peter, Susan, Edmund and Lucy, who enter the wardrobe in an old professor’s attic and find themselves in the strange land of Narnia. There they encounter the wicked White Witch and the great lion, Aslan, king of the beasts. The audience will discover if the children be able to destroy the witch and help good triumph over evil? This production is a beautifully innocent and sweetly charming child-led adaption whose opening night I happily forgave for first night nerves and the sound system breaking 10 minutes before the start. This production is also a delightful escape from Sheffield’s cold winter weather for fans of Narnia young and old. Although all holding their own, from the child cast I must especially praise Charlie Morbin as Edmund, who perfectly captured his character’s boyhood attitude, confidence, greed and eventual redemption; and Lara Briggs, reminding me of the actress Rebecca Ryan, as the narrator, who after a nervous start turned into one of the strongest and most confident narrators of any age I have seen on stage. Suzanne Collett as Aslan not only had the best costume and hair of the night but had also perfected the almighty lion roar, wisdom and deserved authority required for the role; whilst Charlotte Henshaw as the White Witch blended Disney and fairytale villainesses with the desire for power and attitude of someone who has always got there own way. From the adult cast, I must particular highlight David Hague who not only wonderfully brought to life the bumbling yet knowing and likeable professor but also superbly captured the wild wolf like attitude and body language of the White Witch’s henchman Maugrim. For also bringing beautifully to life their bumbling, loveable Narnia residents I must praise Dez Martin as Mr Tumnus and Bob Beckett as Father Christmas (who as audience members we could happily let off for making an appearance in February). In addition to director Steve Holmes and co-director Mike Bokalo, for bringing this adaption to life on stage, from the production team I must also especially praise the costume and set teams, especially for the iconic fur coats and essential wardrobe and lamp post; Chris Boydell in lighting whose clever use of strobe lighting added to the drama of the fight scenes; and prompt Hilary Scowcroft who helped the cast recover from their first night nerves. 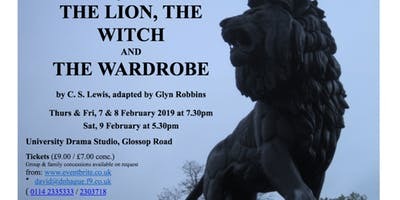 The Lion, The Witch and the Wardrobe will be performed at the Sheffield University Drama Studio at 7.30pm on Friday 8 February and on Saturday 9 February at 5.30pm. Tickets are £9 full price and £7 concessions. To book online visit www.eventbrite.co.uk/e/the-lion-the-witch-and-the-wardrobe-by-cslewis-adapted-by-glyn-robins-tickets-54316919368?aff=ebdssbdestsearch.